I would probably never have bothered to read this book if it hadn’t been written by the noted Australian biographer, Hazel Rowley (1951-2011). For a start, as an Australian I am naturally more interested in reading about our political leaders than American ones, but also I’m not interested in their private lives at all because I believe it’s none of my business, nor anyone else’s. However I was attracted to Franklin and Eleanor: An Extraordinary Marriage when I saw it at the library because it had received considerable publicity at the time of Rowley’s premature death last year and had received generous reviews. It turned out to be well worth reading, partly because it’s so well-written but also because it traverses territory that transcends the individuals concerned. Franklin and Eleanor is about what is nowadays called an ‘open marriage‘, that is, one in which the couple tacitly or explicitly give one another permission to have loving relationships with others. In the case of the Roosevelts, both had relationships which were enduring and which provided emotional support as well as companionship. It would have been unusual for any couple at that time, but it is astonishing that America’s first couple were able to sustain long-lasting extra-marital relationships without the press finding out about it until years after Eleanor Roosevelt’s death. What I liked about this book was that this aspect of a long and successful marriage is handled in a non-prurient way. Whereas American politics today seems to imply that any political dalliances (no matter whether long past or present) comprise a security risk, it seems that the only security risk ever contemplated by the Secret Security forces was Eleanor herself, because they thought she was a Communist. Her activism for social justice was judged to be dangerously left-wing at the time. Her FBI file is one of the largest in the collection, which would have astonished her had she known of it. The Roosevelt marriage was a stressful one, as all political marriages of necessity are: the frequent absences, the demands of political life in general and the feeling that family members have that they must always take second place. The importance of concealing the extent of FDR’s physical disability from the press and public would have added to the tension that always surrounds any appearance by public figures – I cannot imagine what it must be like to have paparazzi surround every move that celebrities make, the sole purpose of which is always to get the scoop that shows a victim in an unflattering light. For the wife in such a marriage, even today, there is usually also the additional frustration of being denied a voice and a career. The women of Eleanor Roosevelt’s generation were expected to make a good marriage, to have children, to support their husbands – and no more than that. (Eleanor didn’t even support the suffragette movement, not until FDR did). But his illness transformed both their relationship and her willingness to conform to society’s expectations: together with the indomitable Louis Howe, she became a crucial aspect of FDR’s campaign team and after his election as president, she became active in a variety of causes from Civil Rights to equal pay for women and national health insurance. The open marriage worked because FDR and Eleanor were intensely sociable people. They liked to have others around all the time, to hold a type of court in their various homes where there were endless visitors and house guests. Although it is known that Eleanor suffered some bouts of hurt and jealousy, there seems to be no evidence that FDR felt the same, though this may of course be only because so much of their private journals and correspondence was destroyed in order to conceal what was happening. Rowley is insistent that this couple loved each other and that the other relationships they had complemented their marriage rather than detracted from it. Two minor criticisms: I didn’t like FDR’s friends who had polio being referred to (twice) as ‘the polios‘ as if they were defined by their illness and had no other identity. In a book at pains to show the life of one man struck down by this illness who refused to let it constrain his ambition or identity, it is an odd choice of idiom. And the photo collection is awful: it’s as if the publishers have chosen almost every photo with a view to portraying these people in an unflattering light. The one of Lorena Hickok showing her fat and flabby in a bathing suit is particularly cruel, but there is also an awful family photo taken at Campobello in 1920 when the entire group including the children looks sulky and depressed. But these quibbles aside, it’s a compelling read, and I’m glad I have Rowley’s biography of Christina Stead on my TBR! PS Sue at Whispering Gums reviewed it too. 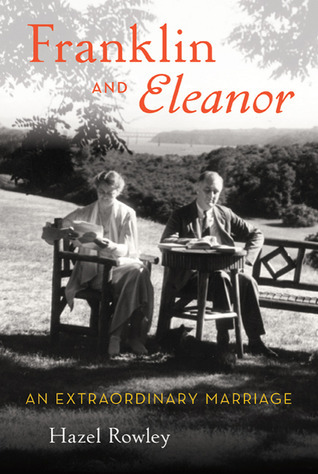 Availability: Fishpond: Franklin and Eleanor: An Extraordinary Marriage (the edition on the LHS above, the MUP edition seems not to be available now). This sounds fascinating, and another friend also recommended it, so i’ll definitely be adding it to my TBR, thanks. Rowley wrote another bio to look out for, about Simone de Beauvoir. And she wrote another about Christina Stead. Glad you liked it Lisa – I read and reviewed it about 6 months ago. I recently lent it to my Dad who was not initially keen when I told him about it last year, but changed his mind and was glad he did because he loved it too. One of the things I found fascinating was how much more “respectful” the media was back then (comparatively speaking, anyhow). I also liked her quoting Camus’ statement about Roosevelt’s generally positive demeanour and that “World peace, that boundless good, ought to be planned by men with happy faces rather than by sad-eyed politicians.” Camus wrote this, I thought? Wow! Thanks, Sue, can you let me have the URL so that I can add it as another review above, please? Oh, and I meant to add that I was interested to read it partly because it was written by an Australian but partly because the Roosevelts were such forward thinkers. Roosevelt’s New Deal during the Depression was hugely significant and I can’t help thinking informed things like our GFC stimulus package. And Eleanor was a significant fighter for human rights. (But then, I’m probably more interested in American history than you are!) I first became interested in American history in high school when I studied the Civil War while at the same time the Civil Rights Movement was in full swing. There is a lot to admire in the USA but we tend always (for reasons I do understand) to focus on the things to criticise. Yes, the part about getting the New Deal through the Congress made think how different things have been for Obama trying to do something similar. I find it extraordinary that ours is the only G20 economy not in recession, and it’s because we had an effective stimulus program! Yes, it’s fascinating isn’t it? And for once the schools did well out of it. Yes, but we also saw rural communities getting long-awaited road-building and other infrastructure: all projects that didn’t require long-winded planning but could be started straight away. If only we could have had urban rail infrastructure as well! I think you’re right, Stu, these two were special – in the way that the Churchills were. But I can’t see myself ever reading a bio of Tony Blair or George Bush or Vladimir Putin! I did read one about Gorbachov once, years ago, and of course I have read Mandela’s Long Walk to Freedom. I found this book fascinating as I do like to know about people’s private lives when they are political leaders. It is interesting to see how both Franklin and Eleanor worked very hard for their country and people, but were still able to have a private life that the press did not expose. I can’t believe the press were ignorant of some of the affairs, but their loyalty to Franklin and Eleanor is admirable. The press doesn’t respect anybody’s privacy now!